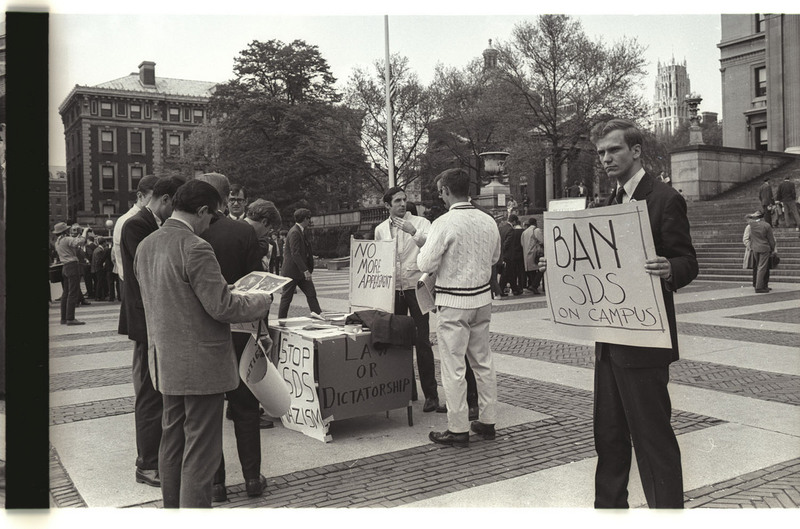 As of 2018, it will be 50 years since the protests on Columbia's campus over the University's link to the war in Vietnam and the construction of a gym in Morningside Park with an alleged "back door" for Harlem residents, which culminated in the occupation of five buildings in April 1968. According to NPR, Harlem community activists and many students at Columbia opposed the gym because they believed neighborhood residents would only get limited access to the facility, which was located on public land. Also, the group Students for a Democratic Society opposed Columbia's link to a think tank involved in weapons research for the Vietnam War. On April 23, 1968, 150 protesters tore down fencing at the gym's construction site and took over Hamilton Hall, NPR reported. For the past 10 years, the Columbia University Archives has been working to gather additional materials relating to the protests. Over the years, many boxes of valuable papers and thousands of photographs (most in negative format) have been integrated into the Protest and Activism Collection held by the Archives' repository. Historian Paul Cronin '13, '14JRN, who is creating a documentary about the protests, as well as writing a book for Columbia University Press, has gathered much of the material. When interviewing alumni with memories of those days on campus, he often comes away with not only oral histories, but also archival materials, which he funnels to the University Archives for safekeeping. "Columbia '68 is a microcosm of so many things," Cronin told Columbia Magazine in 2008. "If you explain the context sufficiently, you're telling the story not just of Columbia '68, not just the new wave of antiwar, anti-imperialist protests in the late '60s, not just how politics affects culture and vice versa; you are telling the story of a generation coming of age at an extraordinary time in America." Similar to the physical and online exhibition the University Archives created for the 40th anniversary, it is now preparing to mark the 50th anniversary. The Archives is calling for any alumni with piles of papers, stacks of photographs, envelopes of negatives, or boxes of flyers, to please contact them and discuss how the material could be integrated into the collection. If you have any materials you are interested in donating to the University Archives or wish to connect with Cronin, please contact Jocelyn Wilk, University Archivist, by e-mailing jkw19@columbia.edu or calling 212-854-1338. Cronin is happy to scan all negatives and prints donated and send high resolution copies on a hard drive. Cronin is also interested in contacting alumni willing to be interviewed about their experience of the protests. Click to explore material in the University Archives. For additional information about the protests, read more from Columbia Magazine and NPR.